Team Stonehenge has been working on improving the new character creation system and we've been very happy with what we've been able to release to date. However, that doesn't mean we didn't have improvements and additions planned, some of which we know players were very interested in having, so let's take a look at what we have added. So, we have this incredible character customization system now, but you can only use it once which seems like kind of a shame, really. It would make more sense to just let you change your character whenever you're in a station. Done. When the update goes live, character re-customization will be added as a new option in the station services list. You will be whisked into the character creator, where all the cosmetic options within the current character creation system will be available for you to adjust and change. Bored of your hair style? Change it. Is your make up not quite the right shade of pink? Change it. Maybe you just want to take your shirt off for a while. You can do all of it from the re-customization screen. Once you are happy with your character's look you can save your new portrait. Your character will be in the same pose and position as when you last saved, so those looking to make quick cosmetic changes can do so without extensive character wrangling to match the previous portrait pose. 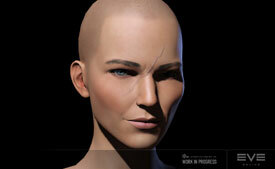 You can, however, completely change every aspect of your portrait including lighting, zoom, expression and background. When you save your new portrait, the update will appear immediately in the local client, however it may take a while for the information to propagate and cache throughout the system so there can be up to a few hours in delay before others can see the wonderful new you. There are a few minor limitations to the re-customization process. Sculpting and skin options are also not available. You will also notice a new feature added to the character customization screen. We've recently added body modification, which offers some new cosmetic features as well as additions to the existing clothing options. What is more awesome than Tattoos? Scars! There is nothing that says, "I'm pretty darn badass" more than a scar on your face. 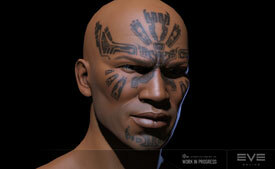 The new scar option lets you select the perfect scar to add that extra bit of character to your character. Are you the kind of person who likes to shove metal into your face? I, for one, am. We have added piercings into character creation, and there are a number of different areas of the face that piercings can be applied to, including the brow, nose, ears, lip, and chin. Each of these areas has different piercings combinations to select from to add that extra accent to your avatar. .
We have also added a couple of new additions to the clothing options. There are now vests for both males and females in a variety of color variations, as well as some sporty new eyewear to choose from. You will not have to spend one Interstellar Kredit, kronur, dollar, euro, yen, lira... not one cent of any currency, real or virtual, to re-customize your character. Re-customize as much and as often as you want, with character re-creation the way it should be - flexible, unlimited and free.